I'm not sure if this is the right place to ask, but what is the game launcher updating after the game itself, does it update the addons for the main Steam installation and if yes, can I somehow stop it from doing so? The config error should be resolved by now. Regarding the DX error, could you try to delete every DLLs in the Arma 3 install directory run Game Updater with the content validation on? Will this keep my mods? When I shift back to Stable? Your mods are considered as game data by Steam, they should remain in the Arma 3 directory. Arma 3 copies installed and maintained by Game Updater are not supposed to be ran from Arma3.exe but from Arma3GU.exe. Regarding the mod management, perhaps there's an issue with the launcher because Game Updater skips the content subscribed from the workshop. I will investigate. Could you, please, host your RPT somewhere and share the link? The best tactic I used was copying Stable Arma folder to a new folder called original Arma., then using Arma through steam as my dev branch. I launch original arma from the arma 3 launcher in the original folder. Arma 3 Launcher has worked for me like a charm. Always use the launcher from the installed folder. The Arma3GU.exe didn't work with launch parameters or mods or something for me if I remember right. Also my mods are installed and detected with the launcher. Have you defined the mod installation folder for the launcher because that was added some pathces ago? Maybe you need to set that up first. The fix for the Arma 3 launcher mod menu works, good stuff. Error! App '107410' state is 0x6 after update job. Error code suggests it's logged in elsewhere, but this method has worked for me up till now. I've also tried while Steam is running in Offline mode with same result. There is other potential causes to this error, this message box just provides the most recursive, the second for this code is "Corrupted data". 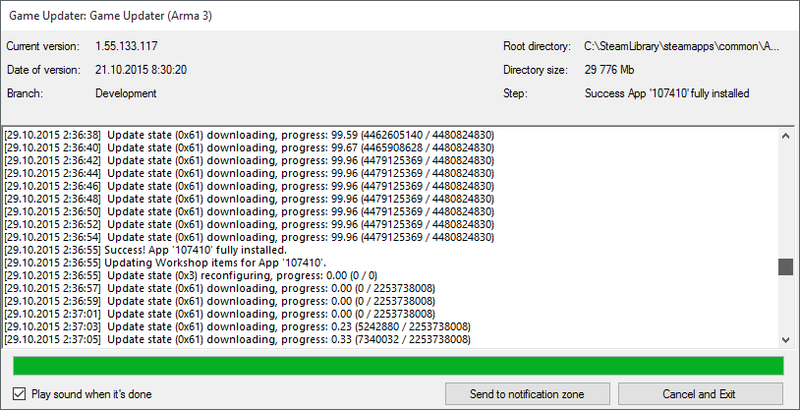 A first test would be to run the clean up script (Delete user data.bat) which is located in the Game Updater directory. Then, try to update again. The next up is to re-download Game Updater (by deleting its folder and verifying the cache of the tools via the Steam client). It's a part of the Arma 3 Tools package, download it through Steam. to download more after using the Dev one.? If you're keeping only one of them at a time with Steam then you need to download every time you switch between branches. The download size really depends and I can't remember which one makes you download more or is it the same Dev -> Main or Main -> Dev. Switching between branches is usually ~0.5-1GB. So Ive had Tanoa pre-ordered where do I get my beta access code to access the weapons etc. Tanoa 'Purchase' option only using this method to access the Dev branch. Is this going to be fixed ? Second installation (game updater) has locked Tanoa unless you have your primary installation (steam library) on dev branch too (which defeats the purpose). Until there is a fix I have just installed the main branch with the official Game Updater and left the development branch activated in Steam. Some information about this is available in this topic. a few month ago we had a personal conversation about an issue I had with the Game Updater. It wasn't able to login into my Steam account. The cause for this issue was actually very simple. My password seemed to contain an invalid symbol or it was simply too long.